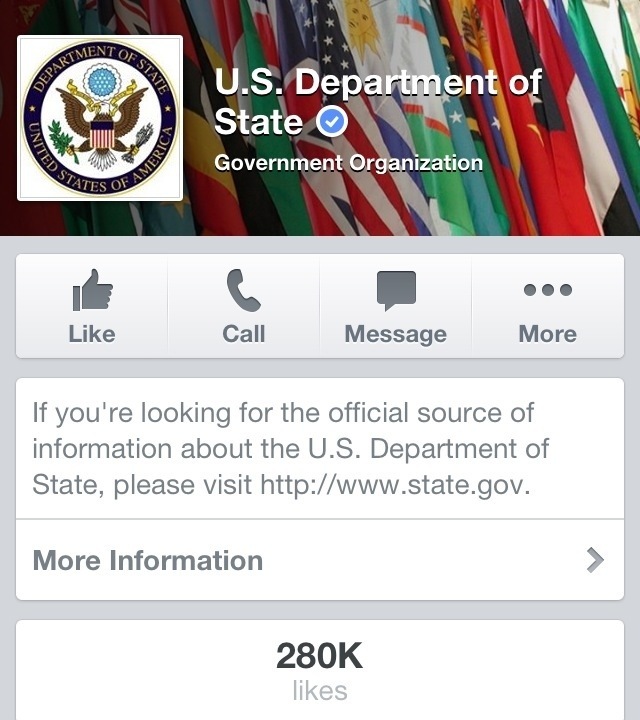 State Department Facebook Spent $630,000 On ‘Likes’ For Social Media Pages. A striking finding in a recent Inspector General report revealed that the U.S. Department of State spent hundreds of thousands of dollars on Facebook “likes” in the past two years, effectively buying fans. In order to bolster its presence on Facebook, the State Department paid about $630,000 for campaigns to increase its total number of likes, the May 2013 report indicates. While the sheer amount of funds the State Department dropped on social media may be surprising in and of itself, the most significant aspect of the report may be the finding that these fans are, for the most part, fake. Brought to light by DiploPundit, the report states that the Bureau of International Information and Programs commenced a crusade to expand the department’s social media presence globally in 2011. Facebook, in particular, was targeted with two campaigns — launched in 2011 and 2012 — with the overarching goal of increasing the department’s fan base on the social networking site. Bunch of air heads with nothing better to do than spend money on garbage instead of given it to those in much need..too much to ask !